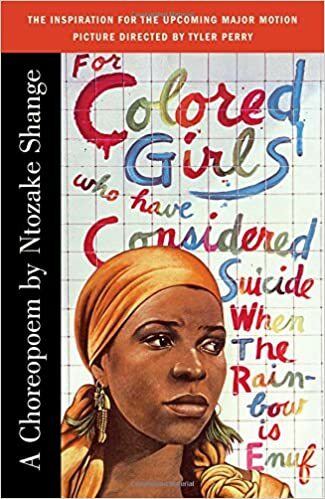 This past Saturday, Ntozake Shange, author of for colored girls…., died at the age of 70. In tribute to her legacy, I wanted to share this piece as tribute to her, written in March 2015. I was 24 at the time the piece was written. I fell in love with the title. I was 19, ten days away from turning 20, when Tyler Perry’s adaptation of Ntozake Shange’s choreopoem debuted in theatres. The all-star cast: Kimberly Elise, Janet Jackson, Loretta Devine, Thandie Newton, Anika Noni Rose, Kerry Washington, Phylicia Rashad, Whoopi Goldbery; the promotional posters: a kaleidoscope of purples, blues, yellows and reds spattered across a white space to creating a woman’s haunting gaze, drips of paint running down from her marble eyes like tears; the movie still: the actresses frozen in an embrace on a rooftop in Harlem, the colors of their clothes appearing saturated in comparison to the grey evening of their surroundings. All of these could have, probably should have, enticed me. But I fell in love with the title. for colored girls who have considered suicide/ when the rainbow is enuf. for colored girls…. is many things. It’s fiction. It’s non-fiction. It’s a collection of poems. It’s a play. It’s a dance routine. It’s defiant. It’s proud. It’s a declaration of independence. But 19-year-old me didn’t know that. I only knew the title spoke to something deep within me and I needed to figure out what it was saying. I had to read the book before I could see the movie. I had to understand what a rainbow was and what made it “enuf.” I ordered the book online. When it arrived, I shut myself in my dorm and prepared to be enraptured. So began for colored girls…. I settled in, nestled beneath my pastel blue and purple covers, preparing to read it like a play. It didn’t take long for me to realize that wouldn’t work. It was like reading Shakespeare, except Shakespeare was a woman, and spoke slang. I highlighted all through my book. But I was 19. And it was my first time ever reading something so uniquely different. I had read Shakespeare and this wasn’t that. It was a play in verse but it was also a song. It was also a dance. It was raw emotion. When I turned the last page, my mind swirled. I crafted the jumble of words into a beautiful representation of love ache, something I felt all the more linked to because I was experiencing my first adult version of it. I didn’t really grasp much else besides how the words made me feel in relation to my own melodrama unfolding. Of course, some stories were vivid, like the lady in red’s recounting of a father grappling with PSTD dropping his two little kids out the high rise apartment window because their mother wouldn’t marry him. There was no misconstruing that story. But some of the other women’s tales were just blurs. When I went to see Tyler Perry’s adaption I couldn’t compare the movie to the text because I couldn’t even determine what I had even read. Now I am 24, five years older than I was then. for colored girls… is 40 years old this year and it makes so much more sense to me now. It is very easy to interpret for colored girls… as just a recollection of love and loss, to see the ladies in their colors as just downtrodden, broken-hearted women at the end of their rope. The rainbow, that phrase that had pulled me in, is the crux. The women in their colors make up the rainbow, make up their own salvation. For colored girls…. had to be a hybrid of things, for it work. It needed the beauty of poetry, the sensuality of dance, the fluidity of story, the production of play, to encompass the full scope of Shange’s lens. She found inspiration in the Women’s Studies Program and Sonoma State College and then coupled her education with dance classes. Beneath each of the dances, the monologues, the poetry, the stories, Shange is telling her own story of how she came to explore and understand her womanhood. And, because her story couldn’t be adequately explained in any one structure, just as any of the stories by ladies in color can’t adequately be described by one emotion, Shange invented her own art form and named it “choreopoem,” a combination of poetry, dance, music and song. Shange needed to discover and embrace herself to debut such an unconventional art form. That is also what each of the ladies in color in for colored girls…. is seeking to do. Despite the traumas they’ve endured, the pasts they can’t forget or escape, the women each seek and find the courage to embrace themselves and discover the freedom that comes from within. But truthfully, the love started with the title.